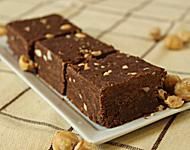 Nutella Fudge is a smooth, creamy chocolate fudge with the flavor of chocolate-hazelnut Nutella spread, and chunks of toasted hazelnuts scattered throughout. 1. Prepare an 8x8 pan by lining it with aluminum foil and spraying the foil with nonstick cooking spray. 2. Place the sugar, evaporated milk, butter, and salt in a medium saucepan over medium-high heat. Stir until the sugar and butter dissolve, then wash down the sides with a wet pastry brush to prevent sugar crystals from forming. 3. Insert a candy thermometer and cook, stirring constantly, until the temperature reaches 236 degrees F (113 C). If you are not using a candy thermometer, you will want to bring the candy to a rapid boil for 5 minutes. 4. After it reaches 236 F, or 5 minutes of boiling, remove the pan from the heat and add the chocolate chips, stirring until they're completely melted. 5. Next add the marshmallow cream, Nutella, and vanilla extract, and stir until everything is well-mixed. Add the chopped toasted hazelnuts last, if you're using them. 6. Scrape the fudge into the prepared pan and smooth it into an even layer. Allow the fudge to sit at room temperature to firm up, for about 2 hours, or in the refrigerator for 45 minutes. 7. Once set, remove the fudge from the pan using the foil as handles. Cut it into small 1-inch pieces to serve. Store Nutella Fudge in an airtight container at room temperature for up to two weeks. Sweet Potato Cinnamon Fudge Made With Real Sweet Potatoes!